The athletic equipment storage area in the new Marcus Mariota Sports Performance Center at the University of Oregon has been hailed as “a testament to style and function.” The equipment room features 2.5 miles of Spacesaver drawers and shelving housed in visually stunning Spacesaver compact mobile storage systems. Thousands of pieces of gear, one room. The room provides much more than efficient storage, though. It’s also a powerful recruiting tool, a place to showcase and display the unique gear, and an environment that the equipment staff is proud to work in. “It’s a huge ‘wow’ factor when the recruits walk in,” says Wasson. See photos and get more information about athletic equipment rooms at the Knight Arena, the Sanders Stadium, and the Marcus Mariota Sports Performance Center. 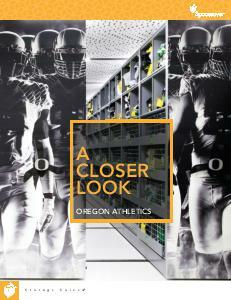 Download the Oregon Athletics Lookbook and see more. The flexibility to eliminate all aisles between shelves allows equipment managers the ability to lock down the shelving system in the closed position. Sometimes organizations find unexpected uses for shelving, like using the outside of the system for a window display.